La Liga doesn’t stop. After FC Barcelona’s important 2-1 win against Valencia at the Camp Nou, the blaugranes will travel to Vigo for the 33rd fixture of the season against Celta at 9.00pm CEST on Tuesday. The blaugranas need seven points to secure the league title and a victory in Balaídos will bring it closer. The match is the start of a important week with the Copa del Rey final against Sevilla at the Wanda Metropolitano at 9.30pm CET on Saturday. For the game against Celta, Ernesto Valverde won’t be able to call on the injured Piqué, Sergio and Iniesta. The squad for Vigo is the following: Ter Stegen, Cillessen, N. Semedo, Denis Suárez, Suárez, Messi, O. Dembélé, Coutinho, Paulinho, Paco Alcácer, Jordi Alba, Digne, S. Roberto, André Gomes, Aleix Vidal, Umtiti, Yerry Mina and Vermaelen. Prior to the squad announcement for the Celta game, the available first team players trained on the Tito Vilanova pitch at the Ciutat Esportiva Joan Gamper. 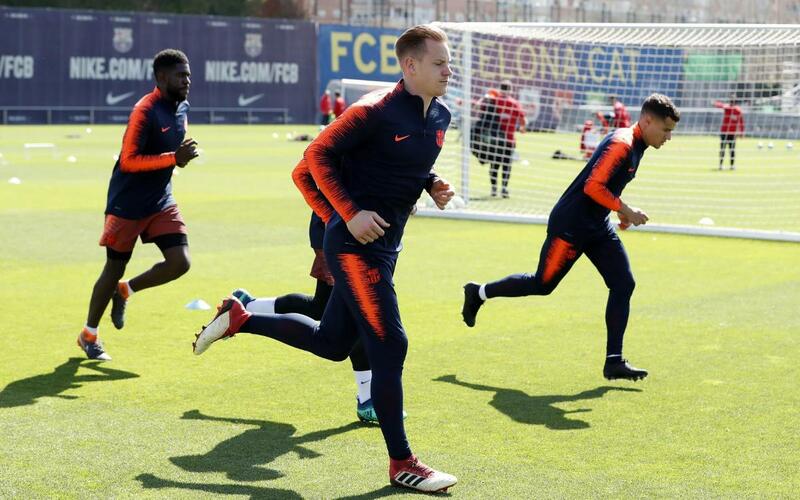 The preparatory training session also saw Barça B’s Jokin Ezkieta take part, while Sergio Busquets and Ivan Rakitic worked out on their own.